Operational Stress Injuries (OSIs) include such conditions as PTSD, seizure disorders, anxiety disorders, depression, and others. 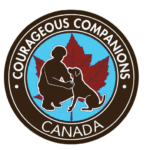 At Courageous Companions, we have seen service dogs significantly relieve symptoms such as anxiety, assist in easing the exhausting and often debilitating impact of flashbacks and nightmares, decrease and even eliminate the need for medications and in many cases relationships have been restored. Courageous Companions can raise and train an Elite Service K-9 specifically moulded to respond to the symptoms of a specific individual. Each dog is being raised in a home setting, fully socialized and live and train with future and present service dogs. Our training philosophy puts the well-being and care of the dog at the forefront and is based on 100%, all humane, non-aggressive, leadership style. We use only a positive, supportive, well-balanced approach which encourages the dog to bond with humans. A Service Dog is a canine specifically trained to minimize functional limitations of a person with a disability. Service dogs may also be referred to as assistance dogs. Includes but not limited to guide, mobility, medical alert, medical response, hearing, psychiatric, autism and PTSD. Does not include therapy, emotional support, companion, facility or comfort. We have found that Labrador, Poodle or Golden Retrievers or a mix of these breeds have the qualities in health, temperament, bidability, trainability and the physical ability needed.